The ADF is implementing a series of activities to protect and restore the forest ecosystem: creation of buffer zones around the archaeological sites, protection/enlargement of existing CPA, zoning of protected areas within the park, mapping for the Mistry of Environment and the Siem Reap Provincial Department of Environment, collaboration with rangers to fight illegal logging, including basic training of GIS and GPS use, reforestation activities and environmental awareness campaign. In the past, ADF worked on provision of training to collect natural resources in a more sustainable way and biodiversity surveys in collaboration with other organisations. One of the main threats to the archaeological sites is the proximity of damaging agriculture practices, including deforestation and uncontrolled fires. Under the authority of the APSARA National Authority and with the active participation of the local communities, ADF has created environmentally-friendly protected areas around the historical sites, allowing the natural forest to regrow and provide protection to the sites from harsh weather, erosion and damaging agricultural practices. As of November 2014, five protected areas, covering a total of 800 hectares and encompassing dozens of archaeological sites, have been delimited with the involvement of local communities. They are regularly patrolled by APSARA workers. This component was supported by ADF and the Ambassador's Fund for Cultural Preservation. The archaeological protected areas have been recognized officially in 2015 by the Ministry of Environment, the APSARA National Authority and the Siem Reap Provincial authorities. There are 5 Community Protected Area in Phnom Kulen National Park. Because of the extension of the cashew nut cultivation, there are now the only remaining forested area in the south part of Kulen plateau. They are are meant to be preserved for the benefit of the local population where they can collect non-timber forest products. ADF is helping the Ministry of Environment and the committees to protect, maintain and eventually enlarge these CPA. Since July 2018, ADF is working on the enlargement and the better protection of one of the 5 CPA. The project is funded by a private donor. ​With the activities focusing on the APA demarcation, the work done by ADF one the Kulen CPA is part of the general zoning of the protected area, within Phnom Kulen National Park. Like every forest in Cambodia, Phnom Kulen is heavily threatened by illegal logging. Large trees are being cut illegally and the wood is used for building furniture or decorative elements. The pressure on the largest trees is mostly driven by the local market for construction, furniture and the tourism industry in Siem Reap. Logging is usually perpetrated at the request of influent Cambodian people. Large areas of forest are also cut by villagers to plant rice and, for the last 15 years, cashew nut trees. This is the main diver of the deforestation in Phnom Kulen National Park. As the ADF team is often working in remote areas of the national park that are not patrolled by the rangers, we systematically record and report illegal logging cases to the rangers of the Ministry of Environment and facilitate their investigation work. In order to better fight illegal logging and illegal farming with Phnom Kulen National park, ADF team is training the rangers on a regular basis about the use of GPS and ​basic GIS recording data. This is possible since 2018 thanks to the financial support of Terre Cambodge. This allows a better management of the protected areas and a stronger presence of the rangers on the field. In 2018, ADF also provided 6 GPS in to the Provincial Department of Environment, for the management of the Phnom Kulen National Park. Since 2015, ADF has been initiated or associated to several reforestation activities inside Phnom Kulen National Park. We have been supporting the Ministry of Environment to define areas to be reforested, by designing the information signboards and implementing reforestation activities, in collaboration with the villagers, the local authorities and the Park authorities. ADF tree nurseries, located in three primary schools (Ta Peng, Sangke Lak and Anlong Thom) are also providing saplings for the areas to be reforested. They act as tools to build environmental awareness for the local young generation. This last component is implemented since 2018 thanks to the generous support of Eau Kulen/ Kulara Company. ADF also supports the monitoring of the replanted areas by the rangers of the Park. Solid waste management is a real issue in Phnom Kulen National Park, particularly on the very touristic area of Preah Ang Thom, the 1000 linga and the waterfall. To build upon the Ministry of Environment new dynamic, ADF and its partner from the private sector Terre Cambodge, have supported an awareness campaign with the setting up of 9 signboards, installed at the strategic and very visited location. The giant honeybee, Apis dorsata, is a large species of honeybee naturally present in Cambodia. 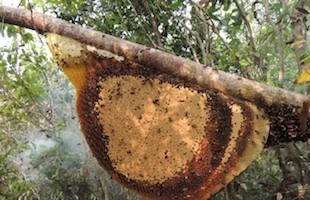 These bees are commonly found in the forests of Angkor and Phnom Kulen and usually live on a single, free-hanging comb attached to the branches of the dominant trees. Hives are collected by villagers, who eat the honey, wax and larvae, destroying the colony in the process. By teaching villagers how to collect honey without harming the larvae and killing the queens, the ADF allows them to collect this valuable forest product in a more sustainable way, for selling it or for their own consumption. This ensures that the resource remains available for other villagers and generations to come. This component was implemented, thanks to a generous donor, from 2013 to may 2014. The fauna and flora of Phnom Kulen has been little studied and remains largely unknown. No comprehensive list of animals and plants has been put together yet, and it's very likely that new species to science will be found on the plateau. To highlight the natural richness of its ecosystem, the ADF is facilitating the implementation of biodiversity surveys on Kulen. In 2012, a team of biologists has been conducting surveys on Phnom Kulen to identify the species present in the National Park, with a special focus on bats, reptiles, amphibians and birds. The survey was funded through ISAC and supervised by Ben Hayes and Alistair Mould, two biologists from the UK who have been working in Cambodia for many years.